You Road Shopping district (ゆうろーど商店街) is one of Shotengai located south side of Kameari Station. There are over 120 shops in this street. 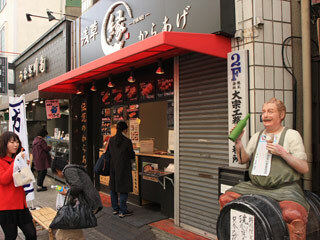 Especially, there are great vegetable stores, meat market and fish market. Of course, other shops such as fashion, glossary stores, food stands and services. It has many Kameari food gourmets. 1. use JR Joban Line to Kameari. You Road is the first Shopping Street built around Kameari Station. It was in 1930. It was used to be called "Kameari Ginza." Today, There are 120 stores in this shopping district. It has the taste of Shitamachi, and great spot for shopping. Also, Kamerai today is very famous for Kochikame. There are many Kochikame goods sold in this spot.